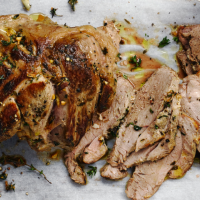 From the first day we opened The River Café, marinated leg of lamb has been on our menu. So that’s how I am cooking my lamb this Easter, but with the addition of milk. Ruth Rogers is a chef at and co-founder of the River Café. 1. Mix together the garlic, thyme leaves, lemon juice and 3 tbsp olive oil in a bowl; season. Make 5 cuts through the fat of the lamb to expose the flesh. Add the lamb to the marinade, covering it on all sides. Leave to marinate overnight or for at least 4 hours. 2. Preheat the oven to 200˚C, gas mark 6. Heat the remaining 1 tbsp oil in a heavy pan. Remove the lamb from the marinade and brown on all sides; be careful not to burn the larger pieces of garlic. Add the remaining marinade juices and the milk and boil on a high heat for 3 minutes. Cover loosely with foil and transfer to the oven; roast for 45 minutes. Slice and serve with the potatoes, baked spinach and roasting juices.